As I mentioned in Part 1, my daughters pickiness was in part the result of Oral Motor weakness. In order to improve her relationship with food we first had to restore the functioning of her mouth. She also had some sensory issues that needed to be addressed and therefore therapy included “desensitizing” her mouth as well. When we sat in the very first meeting with the O.T. I was surprised when, at only 5 minutes into the session, the O.T. asked my daughter “Do you ever lose food in your mouth?” I was so confused?? What does that even mean?? I was beginning to wonder if this O.T. really knew what she was doing? I mean how does one lose food in their mouth and wouldn’t I know that? But my daughters response was much different than mine – she said “YES!!! All the time! !” I was shocked! I said “You do? You actually lose food in your mouth!?!?! ?” and she replied, rather defensively, “Well not all the time!”. Apparently my daughter was orally defensive. That meant that she didn’t really enjoy how things felt in her mouth. She liked food to be “contained” and disliked having random bits all over inside her mouth. She gravitated to foods that she could control and while doing so inadvertently created “dead zones” in her mouth. These areas were spots that she never used and therefore they became under-responsive to the sensation of food. If foods accidently went there while she was chewing, she would temporarily “lose” the food until she located it again with her tongue. That is why she gravitated to carbs (that form a doughy ball), and crunchy things like chips and nachos (they were so pokey they provided her mouth with the input that she needed to keep track of them,) and disliked foods like rice and spaghetti noodles (too many soft pieces sliding off into dead areas). The period of time that the food was missing was very anxiety inducing to her, as she feared that she might choke on it before she found it. Every time she lost a food she shied away from eating it again. It explained why she gradually started to drop previously accepted foods. And it also explained why she hated brushing her teeth and going to the dentist. We did therapy 3 times a day. In the morning before school, after school, and before bed. I definitely recommend doing this therapy more than once a day if possible. Before we started therapy my daughter was asked to do some mouth “stretching” to warm up her mouth and stretch the muscles – it probably aided in having her mouth accept the tools. The stretching consisted of her using her fingertips (first 2 fingers of each hand) to run down the length of her cheeks (from ears to lips) and then placing all four fingers under her nose and stretching her upper lip down repeatedly. They can be purchased in any drug store and are usually referred to as oral swabs. My daughter just dipped them into water before using but some kids might prefer dipping them into juice or something flavored (they can also be bought mint flavored) and some kids might prefer them dry. She used this sponge to get her mouth accustomed to sensory input. 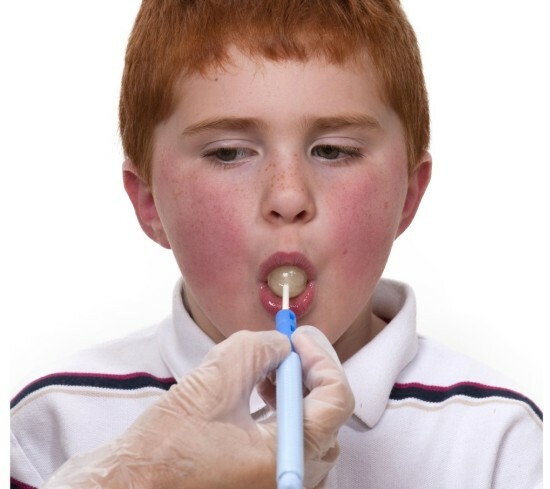 Some kids may not even be able to put the sponge into their mouth initially (for sensory reasons – they make dislike the texture) and in that case I would suggest having your child lick the sponge with the tip of their tongue gradually working towards fully inserting the sponge into the mouth. Do not rush it! My daughter was able to tolerate the sponge so we began her therapy by swiping the sponge over the surfaces of her mouth. So, insert and swipe up and down, inside left cheek, and then inside right cheek. Over all the teeth and gums as if you were brushing your teeth – using the same back and forth motions. Swipe over lips and roof of mouth. Many kids are food avoidant because they have a STRONG gag reflux. This reflex is activated as soon as foods hit the “trigger” point on their tongue. To better understand this – have you ever stuck your finger too far down your throat and gagged? Or tried to make yourself throw up by sticking your finger down your throat? Well, this gag reflex is triggered at different points for people and some kids gag when food just touches the tip of their tongue. This gag reflex needs to be “tamed” before you can move on to the food part of food therapy. To do this you ask the child to stick out the tip of the their tongue and have them roll the sponge back and forth, left to right, across the tip of the tongue. If no gag reflex is triggered (nor do they look like they are fighting one) you can ask them to move the sponge back a smidge and continue to roll back and forth across the tongue. Don’t rush this! Keep the progress slow and steady. Each time you do therapy venture a little further back and keep an eye out for that gag reflex. Triggering it too soon will make them adverse to doing it again! If you do trigger the gag reflex just ask them to move the sponge forward again and continue in a location that does not cause the child any distress. If possible, always end therapy on a good note! If the child gets upset about something, dial the therapy back to a stage that is comfortable and work with them for a while building up trust and confidence again. Another desensitization therapy that we did, in conjunction with desensitization, involved using an electric toothbrush. Specifically a Colgate Sonic Power 360 toothbrush. Apparently this toothbrush operates with a vibration that is the same frequency as the OT’s therapy tools and dental tools. From what I gather it is the best brush for the job. If you cannot find this toothbrush and purchase a different brush my only advice would be to continue to use the same make, brand and model as once they get used to a vibration they will not easily accept a different brush. The batteries eventually die and if the toothbrush is sluggish it impacts the vibration level so make sure to replace the brush fairly often. I inadvertently replaced our with a different make of toothbrush and my daughter rejected it because she hated the vibrational frequency. We used this toothbrush in much the same way at the sponge – as a tool to desensitize the surface of the mouth. Using the BACK side (not the bristle side) of the toothbrush mimic the same movements as before. Swipe the inside of the cheeks and up along the inside of the gums – the top (both sides and front of teeth) and the bottom (both sides and front of teeth). Then she was to insert the brush into her mouth and bite down on the bristles (while it was vibrating) working up to 10 bites on each side. We were instructed to stop if her tongue was attracted to the brush. She had to learn to control her tongue. Controlling the tongue is a very important skill that is required for typical eating. Infants instinctively put everything into their mouth, and use their tongue to explore and understand objects. The tongue is the primary source of information. When babies start with foods the tongue is vital in helping the mouth “chew” the food and move it around – getting it into position for swallowing etc. As babies become more comfortable with foods (and textures), and orally stronger, their coordination for chewing develops and the tongue disassociates from the rest of the mouth. While it is still a very important part of chewing, it understands that what it’s role is and the roles of the other parts of the mouth. If the tongue does not disassociate, it is still attracted to whatever is put into the mouth and interferes with the rest of the mouths ability to do it’s job. Here is an article on learning to chew that better explains the process. Sara’s tongue did not learn to disassociate and was in fact contributing to her “pickiness”. It was still a retained reflex. If the all the parts of the mouth don’t work together in harmony you end up with a disorganized mouth and difficulty eating, chewing and swallowing. Looking back I remembered how Sara’s tongue used to “chase” the toothbrush when I brushed her teeth. I realize now that she was not actually the one in control of her tongue and it literally did have a mind of its own! I can’t stress enough that any therapy should be done with a professional. These particular exercises are probably safe to do at home without supervision, but as we move along and I describe the therapy that we did, I have to emphasize that without proper supervision you can inadvertently cause more problems than you fix. There are very specific ways to build up strength in the mouth but doing them wrong just reinforces bad techniques and you may require therapy to undo the bad habits. In Part 3 I will discuss other therapy techniques that we implemented. I also have emphasize that the therapy we did is not “universal” therapy. This therapy was specifically geared towards MY daughters specific Oral Motor needs and they are not a “one shoe fits all” fix for all picky eaters. It is important to uncover the core issues affecting your childs specific Oral Motor challenges and address them correctly. This series in meant to provide the reader with an insight into the vast number of issues that can cause a child to be a “picky eater” and should not be used as a therapy tool. I am only aware of the underlying issues that I was educated about. But, I hope that by sharing our story, and what I have learned, that others may benefit and better understand the complexities of eating.